Our organic NSA wines are made without added sulfites. What do wines labelled " made with certified organic grapes " and " organic wines " have in common? The fact that they were both made with grapes certified grown organically i.e. grapes grown without pesticides , pesticides and chemical fertilizers. Each day people reach out to us because they have developed some sort of intolerance to conventionally made wines. So if you are one of these unfortunate souls, worry not , you are not alone. Arguably, our bodies are exposed to & have to adjust to many aggressions and to more and more chemical agents; eventually something has to give and for some of us it gives when we sip a glass of wine. 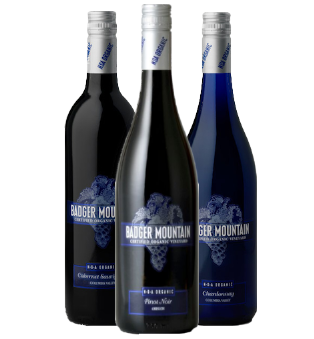 Our general catalog, our brands of organically grown wines may just be the ticket.- grapes are certifed organic and minimal amount of sulfites are added to them. If on the other hand you suffer from asthma or have been categorically identified as allergic to sulfites and ordered by your MD to stay away from a number of food products, then you are in the right place as well: you are the person we carry the Badger line for. These are excellent wines made by our long time friends up in WA. They contain no added sulfites and therefore are labellled " organic " . Whether you start of with "organically grown wines" or "organic wines" do be responsible please , have a few sips , see how you feel and take it from there. We look forward to hearing your questions and your comments and feel quite confident that with a bit of research you might well be able to bring the joy of wine back to your table and to your life.